While technology is developing, devices are getting smaller. Especially when we are talking about electronic devices like smartphones and cameras. Blackmagic Design produced Blackmagic Pocket Cinema Camera before and made it possible to capture cinematic high quality film looks on-the-go. 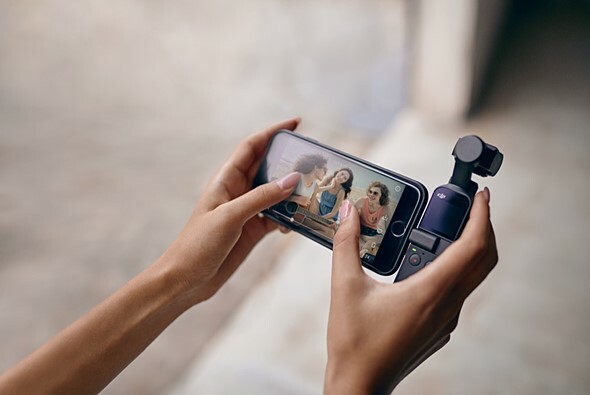 As pocket size devices are getting popularity, DJI has lately released OSMO Pocket, the smallest 3-axis stabilized handheld camera they have ever designed. DJI has managed to create pocket size stabilized camera that can record 4K Ultra HD with 1/2.3” CMOS sensor. Also having additional specifications below, cinematic video recordings have never been easier, practical and pocket-size. OSMO Pocket seems to have much potential to address all vloggers’ needs with its image quality and small size. With a price of $349, OSMO Pocket is looking like one of the best choice for those who are looking for reasonable price on 4k handheld video recorders which creates cinematic film looks possible. OSMO Pocket has a creative and handheld design along with its sensor and additional camera specifications. Having a 1/2.3” CMOS sensor with 12M effective pixels, OSMO Pocket is capable of recording 4K Ultra HD up to 3840×2160 resolution with 60p. Using still photography modes which are single shot, panorama, timelapse and motionlapse, you will catch your dream captures and put it in your vlog or youtube channel. Osmo Pocket does not come with an SD card in the box. Remember to purchase separately if you don’t have any. Osmo Pocket has 140-min battery life, you may want to buy extra batteries if you think 140-min is not enough for you. Have DJI Mimo which is an app you can view during recording, as well as other editing tools for your photo and videos. *DJI Mimo app is not live yet to download but will be available soon. Also remember to look for 3rd party retailers where you can get lower prices. Take advantage of latest DJI online promos finding them after search on google.com. Thanks for reading. Please subscribe to get the latest technology news and more product reviews. Sharing is caring! Share this by copying the url and let your friends know!